November 4, 1998 – It was an evening to remember for a lifetime. 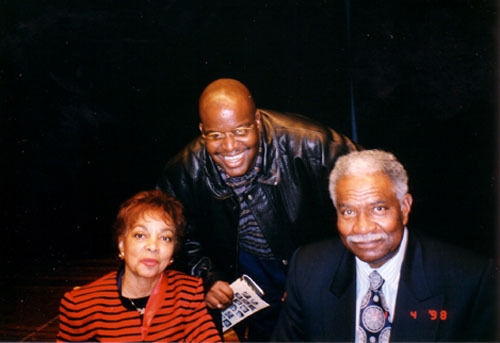 I had only been in Oakland for a few months when I heard that Ruby Dee and Ossie Davis were going to be speaking and signing their autobiography, With Ossie and Ruby: In This Life Together, to benefit an elementary school in Berkeley. I thought to myself that they were living history so this rare event was not to be missed. They shared wisdom that evening that only a couple that had been together for 50 years could share. It was a packed auditorium and I even remember seeing activist Angela Davis sitting in the back of the room. I was honored to have the above photo taken while I was getting my book signed after their lecture. It is definitely one of my most treasured photos. I even gave copies of this photo to my family during the holidays that year. Ossie, you will always be remembered in our hearts. This entry was posted on Sunday, February 6th, 2005 at 6:39 pm. It is filed under Special Feature. You can follow any responses to this entry through the RSS 2.0 feed. Isn’t it amazing how some people just touch your life?